Here’s you’ll find the best make up method to open up small eyes. It’s the classic case of you wanting what you can’t have! A straighter arch for your eyebrows will make your eyes seem bigger. This is because the straight line almost opens up the whole eye area. Note in the illustration that the eyes are exactly the same size, with just a difference in eyebrow shapes. Trim your eyebrows in a straighter arch, then fill them in with eye liner or eyebrow powder. Lighter colors enlarge, and darker colors shrink an area. Slightly shimmery colors are even better because they reflect light and brighten up the eye area. Let’s go through the process using a two color palate. Step 1: Apply a light, neutral color on the inside corners of the eye. Take it all the way along the lower lash line. Step 2: Apply a medium (light) color of your choice. Place this over the outer ¾ of your eyelid. Then go to the outside half of your eye. Take this color just outside the crease to create a fan shape at the outsides of your eyes. 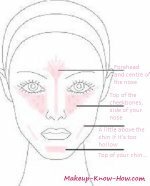 This also elongates your eye profile. If you prefer, you can even apply this shade just under the bottom lash line, almost like an eye liner. Step 3: You can use brown eyeliner if you don’t want to darken the eye. Black eyeliner will create a little shrinkage. This will be balanced by the placement of your other makeup. The impact of defining the lash line and eyelashes is more than the shrinkage caused by the black color. I always take the liner outside of the outer corner of the eye in an "almost wing" way, because this gives the eye a little more length. Apply eyeliner and mascara to the outer ¾ of your eye. Make it a bit thick, especially at the centre of your eye. Play around with your eye shadow looks without concentrating on having small eyes. There are so many looks that will look good on you!